Police have taped off Old Church Road as they investigate a stabbing. Two teenagers have been arrested on suspicion of attempted murder after a boy was stabbed last night (November 18). 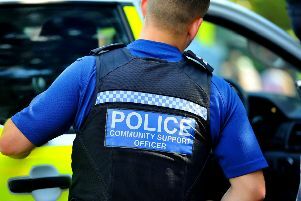 Police said a 16-year-old boy was stabbed in the stomach in Old Church Road, close to the junction with Battle Road, in St Leonards, at about 6.50pm. He was rushed to the Royal Sussex County Hospital in Brighton where officers say he remains in a critical condition. A 16-year-old boy and an 18-year-old man have been arrested on suspicion of attempted murder and are currently in police custody. Anyone with any information is asked to contact 101 quoting reference Opcharing.